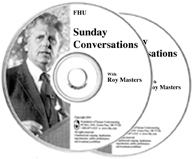 Without a doubt, this is one of Roy Masters most fascinating Sunday sessions. No, it isn’t a talk for the faint of heart, or for children, but it is the perfect talk for those with a searching heart. Roy and his audience have the time of their lives. You’ll wonder at the amazing effect that Roy’s lightheartedness has on those who have the courage to tell the truth on themselves. Darkness has nowhere to hide. Whether you’re married or not, the content applies to us all. The relationship between men and women has rarely been spoken about like this. Roy also looks at our reactions to injustice, the cowardice of the politically correct, intimidation, how tyrants get away with murder and what it really means to stand your ground. CAUTION: The talk contains a powerful exorcism; not appropriate for children.